Company’s coming…YIKES! We’ve all been there. Company’s slated to arrive in 30 minutes, and the house clean-up that you slated plenty of time for got swallowed in the souffle. My Grandma used to say, All I need is a glass of sweet tea and a clean bathroom. My friends, if you have time for nothing else, clean and tidy the guest bath. It’s most likely the only room in your home guests will spend any time alone, with the opportunity to scrutinize. Wipe down surfaces, toilet, and mirrors with your favorite disinfecting wipes and glass cleaner, give that porcelain bowl a cleaning swirl, restock toilet paper, hand soap and towels as needed, empty the trash, and viola, the WC is a happy place to be. Approximate time: 5 minutes. This is not a “how-to make your home sparkle” lesson—it’s a hail-mary guide to swift cleaning—which leads to our next step: quick pick-up. Grab your handy-dandy laundry basket and do a once over of all the rooms your guest will inhabit, placing all household shrapnel in the basket, and then into a quiet closet to be sorted through another time. We all have know the golden rule of cleaning, start from the top down. Grab a choice duster and do a quick loop around the common areas. Follow this up with a vacuum run or broom and dust pan and your all but set. Don’t forget to roll a vacuum or lent roller over your furniture if you’re favorite four-legged friends enjoy the occasional nap on said furnishings. Your guests, and their black pants, will thank you. And please, forget the inclination to mop. For better or for worse, your guest will most likely leave their shoes on, which will quickly moot the point. And, they’d never notice anyway. Approximate time: 12 minutes. Grab your favorite surface cleaner (a pinch distilled vinegar will do the trick) and paper towels, sponge, or a microfiber cloth, and give all kitchen surfaces a quick once over. Approximate time: 3 minutes. Last, but not least, take out the garbage, recycle, and compost. 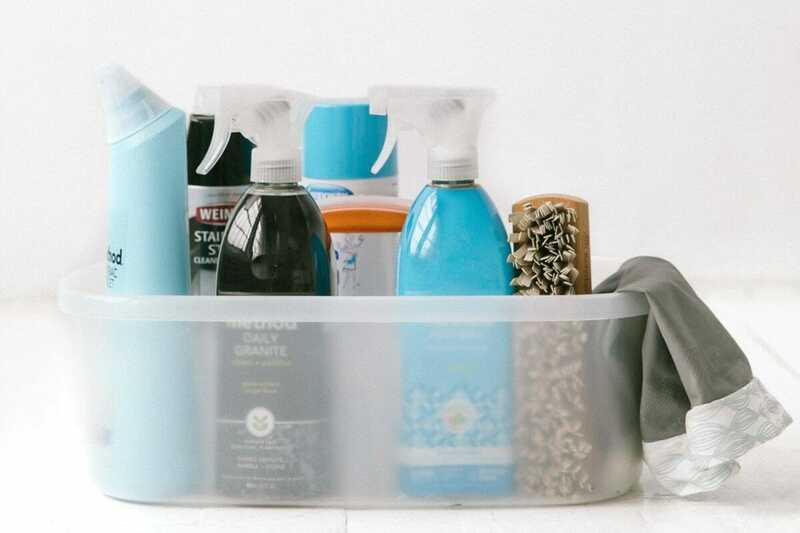 Not only will this help your evening run more smoothly by not having an overload of trash or recycle, it will ensure your home doesn’t smell like last night’s takeout. This is also a great job to assign to your partner or children. Bonus points for throwing in a Yakety yak, don’t talk back with your call for assistance! Approximate time: 5 minutes. And there you have it. Time to open the wine and enjoy yourself. And of course remember, guests appreciate a clean house, but the gracious act of inviting friends and family into your home will always overshadow those devilish dust bunnies.